At about 15 minutes from Les Sables d'Olonne and its beaches, this 19th century vendenne farmhouse, surrounded by 3 hectares of tranquility, offers you this exceptional gîte furnished with comfort and modernity for 8 to 10 people (4 double beds + 2 d 'additions for children or young teens) in a barn completely restored. The lodging of the DORINIèRE that welcomes you all year is the perfect place to spend a pleasant stay with family or friends, relaxing and being lazy in order. For your comfort all year you have a secure indoor pool and an outdoor Jacuzzi or you can relax, all heated to a comfortable temperature. 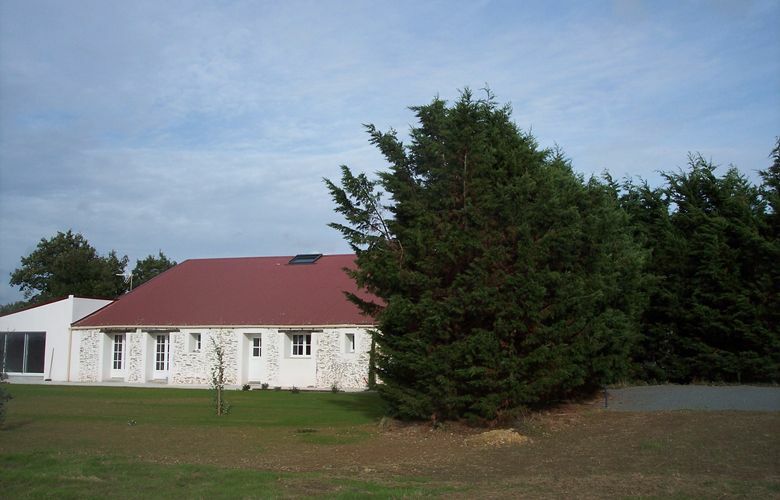 To complete your fitness fitness equipment is available in this cottage in the Vendee. There were eight adults in our party and we were in the area mainly to play golf. We found the property to be of a really excellent standard. There was everything we needed and the owners could not have been more helpful, it is the best property I have stayed in the district, and the golf was great too! We would highly recommend it, and hope to return next year. Le gîte est vraiment top et le jacuzzi est très appréciable !!! Standing in acres of its own grounds that contains a pétanque court, beautiful mature tress and surrounded by open farmland. This gite is something rather special, Alain & Nathalie have an amazing eye for detail, the bedrooms are individual and beautifully decorated, each bathroom is just as individual with very high quality fittings, showers and accessories. The kitchen is so perfect, well appointed and easy to use that in 2 weeks we cooked every night, including several bbqs on the Weber BBQ. And the pool...it is so much better then the photos, our children enjoyed it as did the adults doing lengths to work off the bread and cheese! 15min stroll into the village in the morning to buy your fresh bread and back home for a fresh coffee made in one of the 2 separate coffee machines in the kitchen. Beaches are plentiful and all within very easy reach. Alain & Nathalie are wonderful hosts, on hand to answer any questions and their attention to detail is simply stunning. The gite is so perfect we booked next year whilst there! I could write just how perfect the gite is but you simply have to experience it for yourself. Nous avons trouvé le gîte parfait. Il est très bien agencé avec une salle de bains dans chaque chambre, ce qui était très pratique. Tout est bien entretenu et rien n'y manque. Nous avons beaucoup apprécié la situation au calme mais proche de la mer. Les propriétaires étaient avenants et d'une grande discrétion pendant tout le séjour. Les enfants ont adoré la piscine intérieure chauffée et l'immense terrain sans vis-à-vis avec vue sur la nature. Nous avons donc passé d'excellentes vacances et nous recommandons vivement ce gîte ! Nous étions 3couples et 4 enfants de 7 à 12ans pour occuper cette maison aux trés grands espaces parfaitement équipée avec gout et qualité et des propriétaires trés sympathiques discrets et à notre ecoute . chauffé et un agréable terrain de petanque pour réjouir toute la famille! A RECOMMANDER VIVEMENT ET SANS HESITATION !